Clothes Moths are smaller than a general house moth, with their bodies being roughly 7mm in length. They have a wingspan of anywhere between 10-15mm. They can be identified by their two-coloured wings - forewings are gold and hindwings are typically paler. Unlike many moths, they are not attracted to light. So, they typically harbour in areas with low light. Tinea Pellionella or the Case-bearing Clothes Moth are predominantly found in warmer climates during the summer and late autumn months. So, in the UK’s case this will be from June – September; however, with advancements in central heating, case-bearing clothes moths can now be seen all year-round, taking the seasonality out of their cycle. Adult moths of this type are small and mottled brown in colour with small black spots across their forewings. They have a wingspan of 9-16mm and both the forewings and hindwings have a hairy fringe, making identification of this type of moth slightly easier. Case-bearing clothes moth larvae feed on keratin in natural fibres primarily in the form of natural fibres such as wool, cashmere, silk, leather and fur. Once they have consumed these natural fibres as food, they make a portable case out of food debris in which they can grow and hide. The female will lay around 40-50 eggs over the course of 4-7 days after mating, which will then hatch into the most destructive phase of the moth’s life: the larvae stage. The larvae of clothes moths feeds on everything from clothes to other household goods made from textiles. They are usually between 1cm to 1.5cm long but this can depend on the availability of food. The moth larvae drink by absorbing moisture from the atmosphere, so humid conditions are more favourable for them. The clothes moth larvae can stay in this stage for as long as 3 months until conditions become favourable for them to begin the next stage – pupation into adult moths. The moths spin a cocoon to metamorphose into their adult form which can take as long as 19 days or as little on 9 depending on the conditions. This process leaves debris which looks similar to rice which can be the first noticeable sign of an infestation. The adult moth only has one purpose: reproduction. Once it has left the cocoon it will mate, lay its eggs then die within a period of 4-6 days. Finding the 3 stages of the life cycle requires vigilance as clothes moths are small and favour dark conditions. Often you will notice damage before actually seeing any adult moths. It’s the larvae that causes this damage, through feeding on natural fibers in clothing and carpets. Commonly, clothes moths lay their eggs in dark places, so pay attention to corners of wardrobes, drawers, skirting boards and architraves. 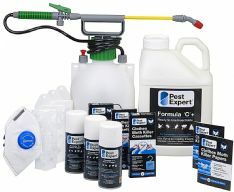 One simple way to identify your infestation is to look for discarded cases, there are few household pests that leave cases behind, so if you find these then it’s quite likely you have case-bearing clothes moths. Case-bearing clothes moths infestations can originate from bird’s nests, especially in unused chimneys, so when trying to identify the source of the infestation it’s useful to check any unused chimney shoots or attics. Treating an infestation of clothes moths can be relatively simple. 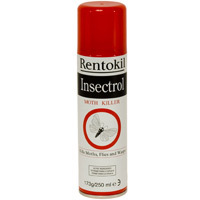 Domestic treatments include cypermetherin based sprays, which are lethal to moths and other insects. 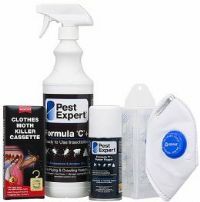 Pest Expert Formula 'C' Clothes Moth Killer Spray is a fantastic product to treat the inside of wardrobes and drawers as well as applying to the edges of the room to protect carpets from damage - its residue is effective against moths, eggs and larvae for up to 12 weeks. 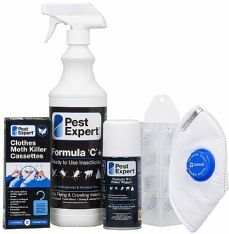 Fumigating with Pest Expert Formula 'P' Foggers or Super Fumers will also help eradicate any adult clothes moths in the room. Once an initial insecticidal treatment has been carried out, Demi-Diamond Pheromone Clothes Moth Traps can be used to monitor moth activity and whether it is necessary to do a follow up treatment. 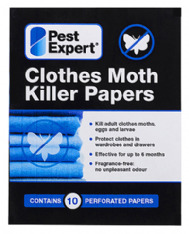 To protect clothing in wardrobes and drawers it is also recommended to use Moth Killer Cassettes or Moth Killer Strips, which kill all life cycle stages for up to 6-months. 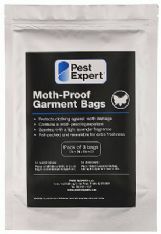 To protect particularly sensitive or expensive items against moth damage, use Moth Proof Garment Bags. After the infestation has been eradicated, good housekeeping, e.g. 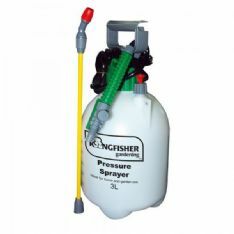 thorough vacuuming can help to prevent the infestation re-occurring. There are other ‘home remedies’ which can be helpful, e.g. 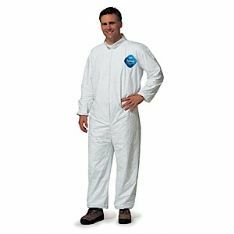 washing clothes at very high temperatures (if appropriate) or freezing any infested clothes or fabrics. 6. Install Clothes Moth Traps in the room to monitor activity. Fold the plastic holder into a toblerone shape, peel the backing strip off one of the pheromone pads and insert into the trap with the sticky side facing out. 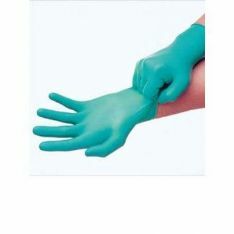 Each pheromone pad is effective for 4-6 weeks.